Just before dawn, I load myself down with camera gear and head for the beach. 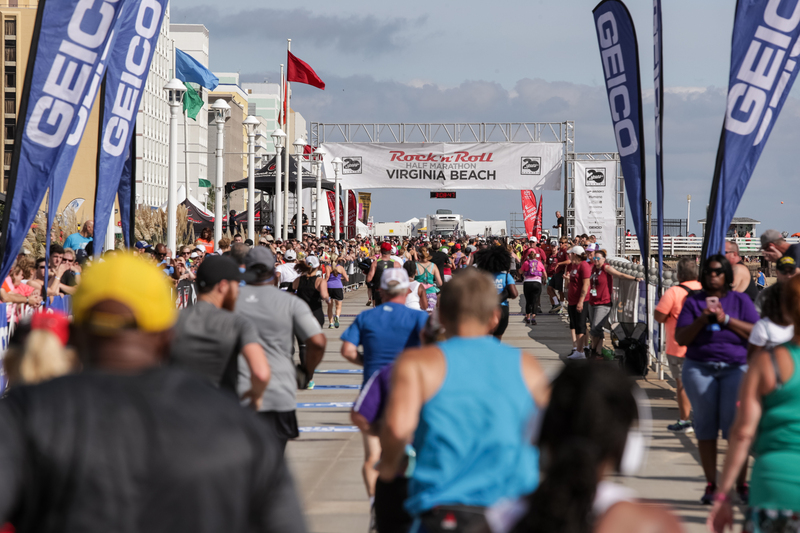 I’ve spent the past few Labor Day weekends in Virginia Beach, photographing the annual Rock ‘n Roll Half Marathon. It’s a perfect send off to summer before fall race season ramps up. The last gasps of Hurricane Harvey had just pushed up the coast and conditions were favorable for an idyllic day at the shore. 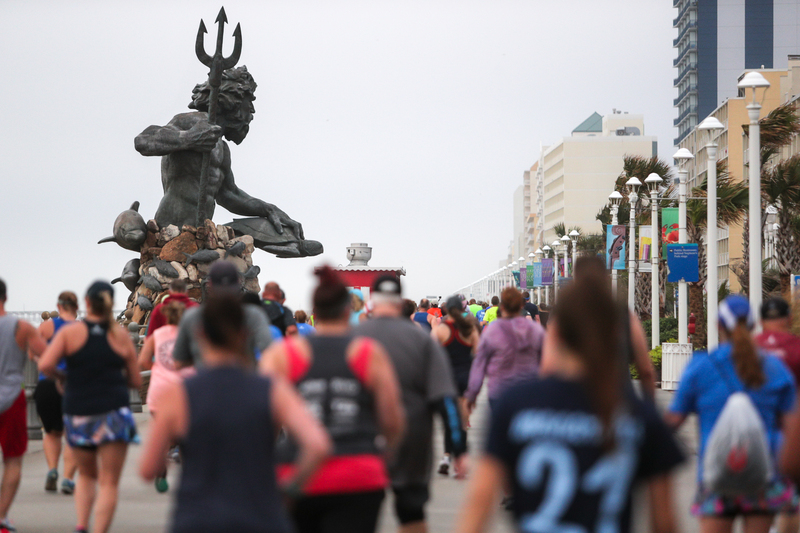 The race route would send thousands of runners past miles of sunrise-soaked beach homes, surf shops, high-rise hotels, mini-golf courses, carnival rides and pancake houses before ultimately leading them down the boardwalk to a finish festival in the sand. What? There’s ‘cross in Norfolk today?! I had no idea, but sounds good to me. Mike texts me a link to more info. Turns out the event is put on by the Rustbucket Races guys, Colston and Gordon. 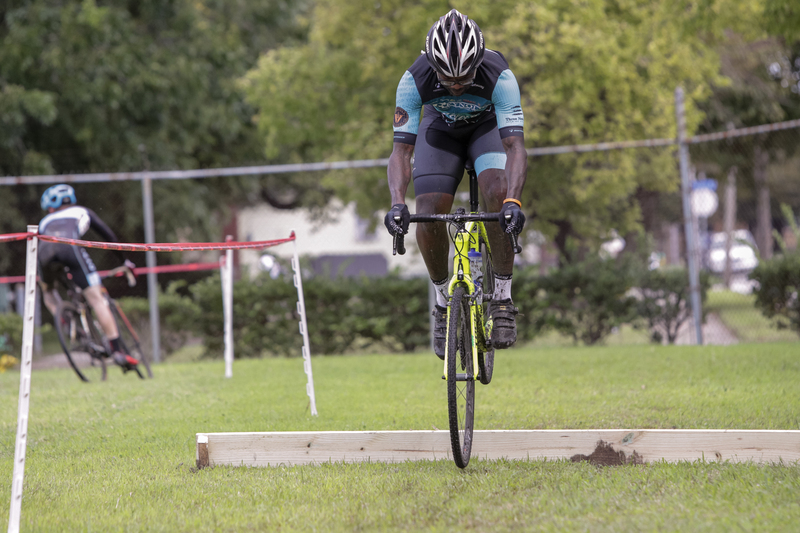 Despite being relatively new to the ‘cross scene, the promoters pulled together a late-December non-series race last year that drew a respectable crowd of new and veteran ‘crossers to a never-before-raced venue. 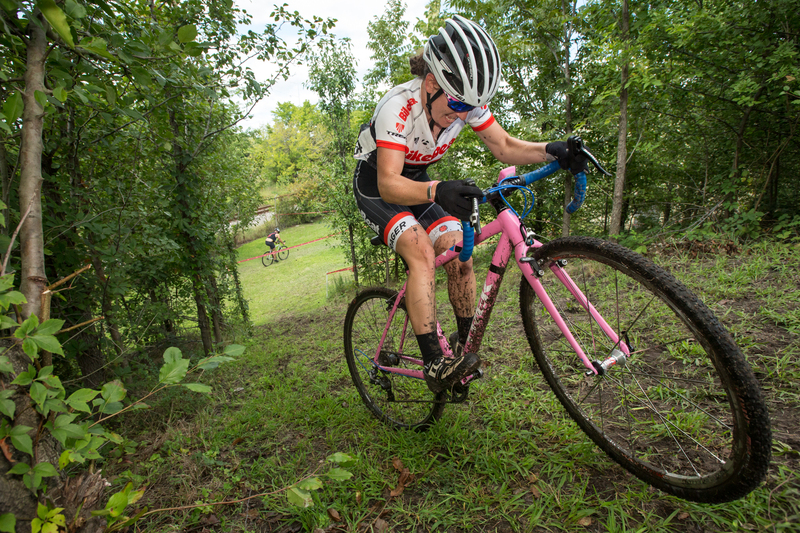 This time around, Rustbucket is hosting clinics and training races to kick off the season. Since I couldn’t make it down there for the December debut, I was looking forward to seeing what Rustbucket was all about. After the marathon ends and I finish filing my photo highlights for the day, I pack up and head a few miles down the road to neighboring Norfolk to catch the last race of the day. For anyone unfamiliar with the Tidewater area, it’s not all beaches and boardwalks. Norfolk is home to one of the largest seaports on the East Coast and there’s a deep blue-collar aesthetic that flows through the community. The Rustbucket venue lies in one of the city’s several industrial areas. 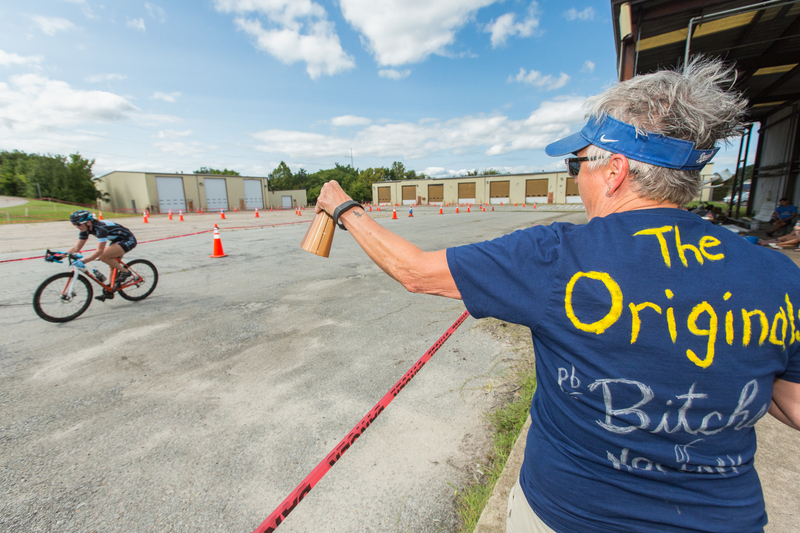 Over the years, Norfolk’s Department of Public Works has used the site for everything from impounding cars to storing hurricane debris. 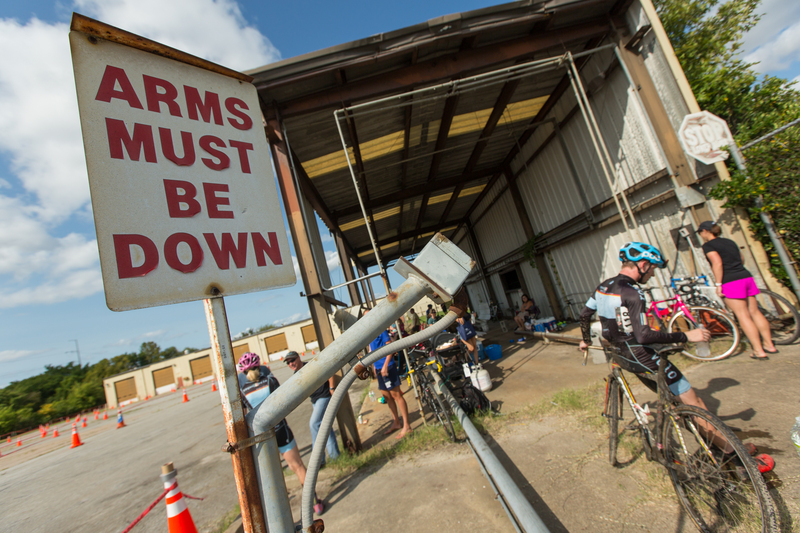 As I walk up, racers are already gridding on a big patch of asphalt tucked in among some old warehouses. It has the vibe of a pick-up game at a city park—everything seems pretty loose and casual until the whistle blows. Some are kitted in full club gear. Others are in street clothes. 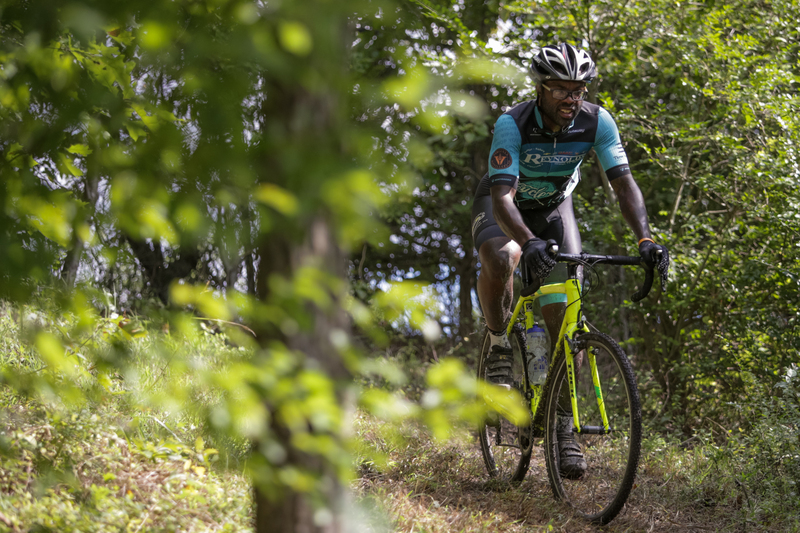 Everyone is there to ride hard. Among those toeing the line is reigning Women’s 30-34 National Champion Avanell Schmitz, who helped lead a clinic earlier in the day. 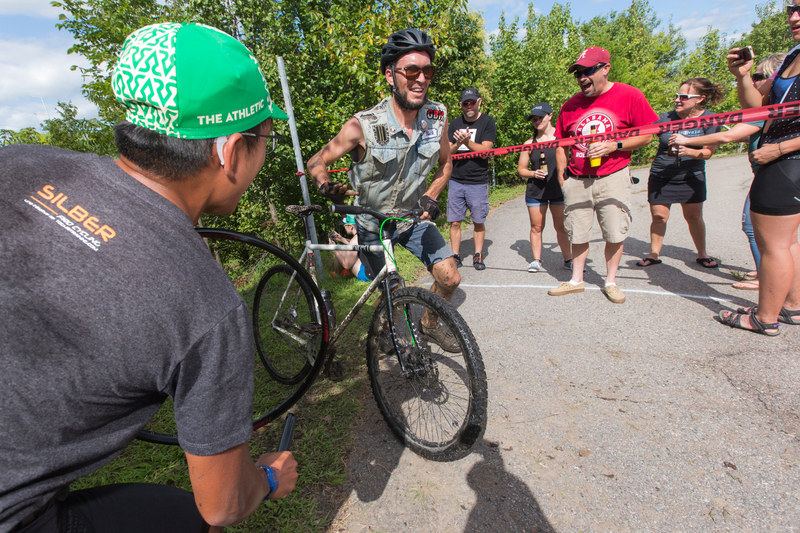 There are blinged-out ‘cross rigs, street-worn singlespeeds and even a fat-tire bike. What you ride or what you wear isn’t important. 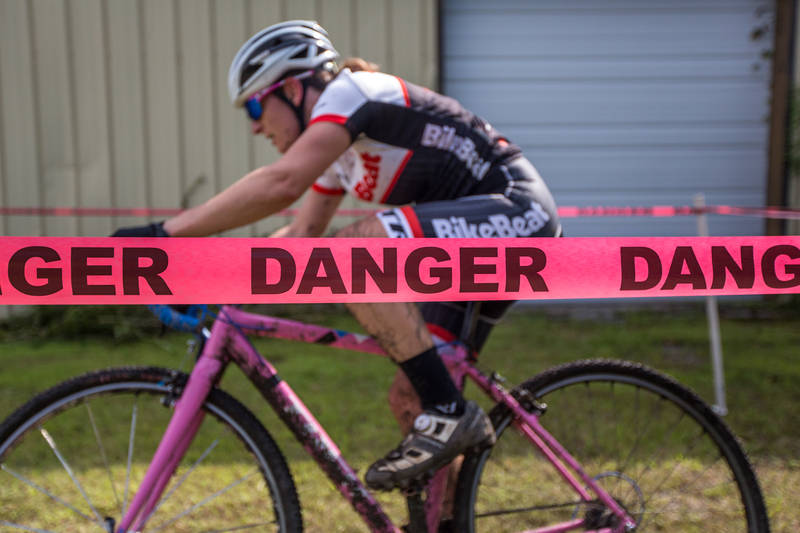 There’s ‘cross happening in Norfolk today and that’s all that matters. 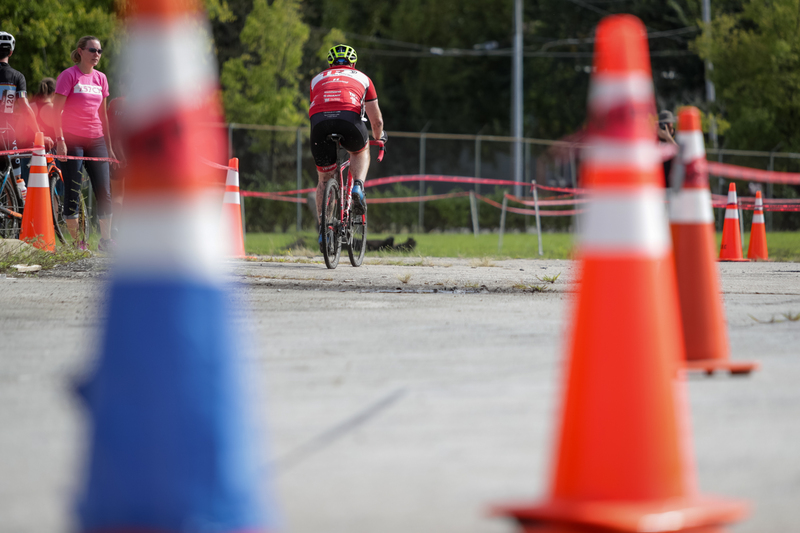 A good portion of the course rolls over neglected stretches of asphalt on a course marked largely by a maze of traffic cones (I stopped counting at 30). 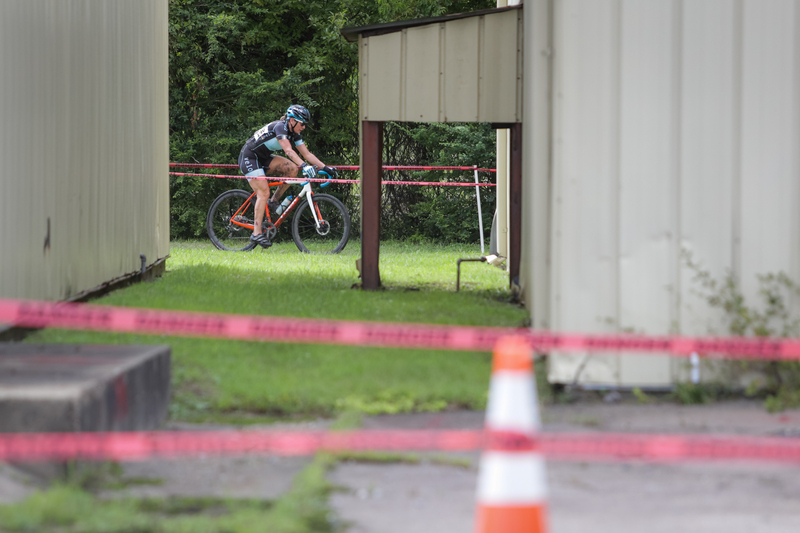 Racers weave among the industrial beige buildings that dot the site, some stripped of their metal cladding and rusting in the humid coastal air. 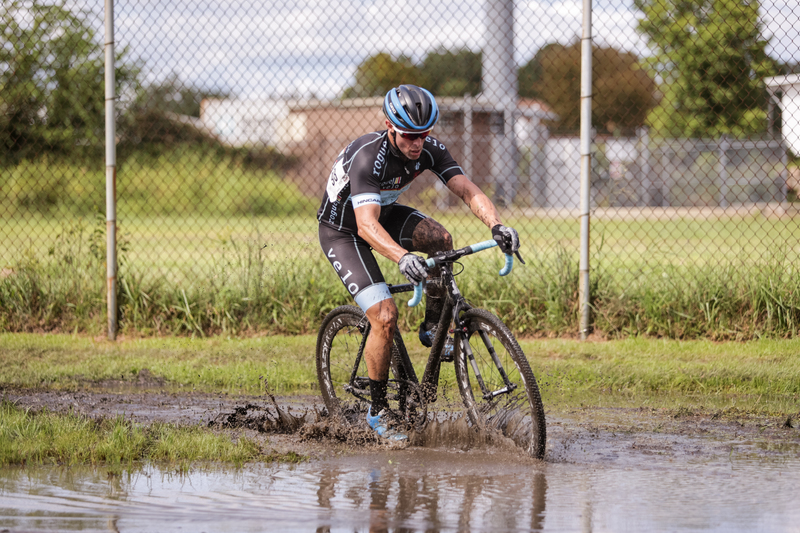 Over the past two days, Hurricane Harvey created huge puddles and boggy areas on the grass and gravel sections of the course, guaranteeing that everyone is going to get muddy. Oddly, the only ‘cross terrain that seems to be lacking on this beach-adjacent course is sand. The highlight of the venue is the hill—a large man-made earth berm that was once used to load ground-level trucks from an elevated platform at the top. In a town with an average elevation that’s less than 7 feet above sea level, this is quite a find. In fact, Colston claims it’s one of the steepest hills in the city, as well as one of the highest spots in the area. It’s a big reason why this site was chosen for the race. 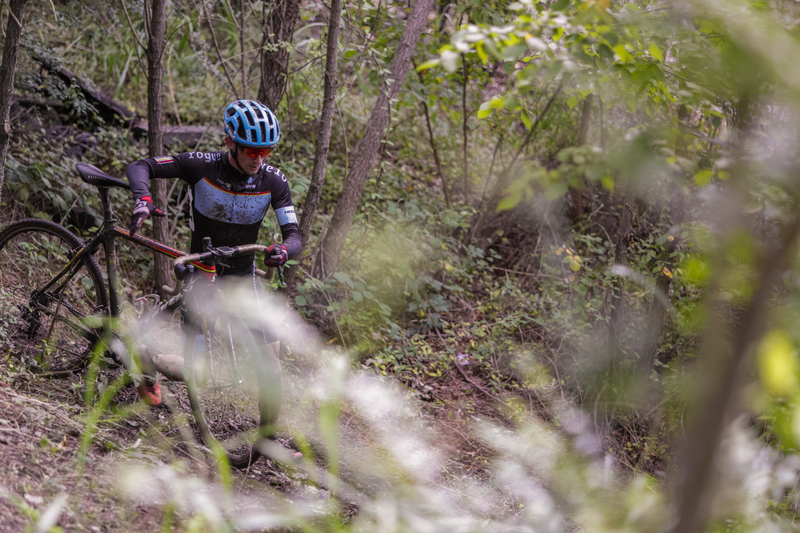 Rustbucket takes maximum advantage of the feature, including sending racers through a tricky off-camber thicket-lined section along its backside. 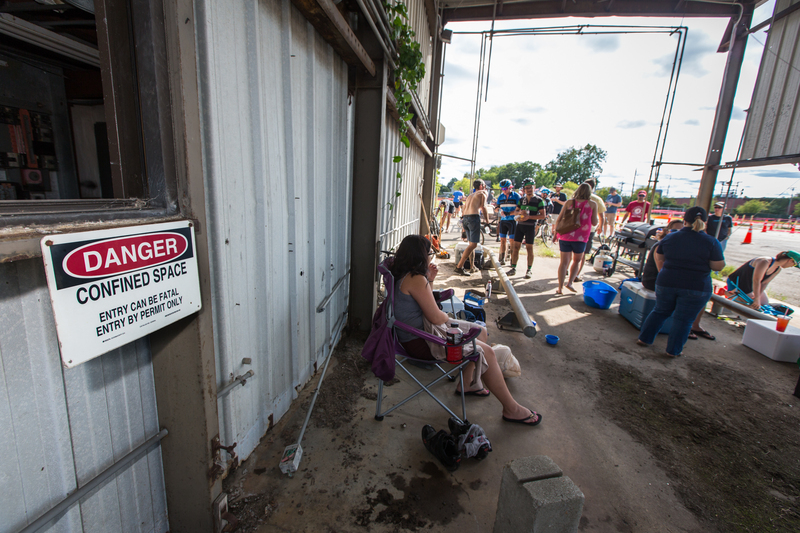 Friends and fellow racers hang out in one of the dilapidated buildings to cheer and heckle (but mostly cheer). If you’re hungry, someone brought a grill you can probably use. Help yourself to something from the cooler, too. It’s a training race and no one is getting pulled. Racers are being lapped and it’s unclear where anybody is placed in the pack. But it doesn’t matter. It’s training. It’s fun. There’s ‘cross happening in Norfolk today. Eventually, someone wins (in fact, it’s Mike Carey’s son) and everyone makes the final push to the line (including a couple of mid-pack sprints for pride). A few prizes are handed out. Post-race stories are exchanged. 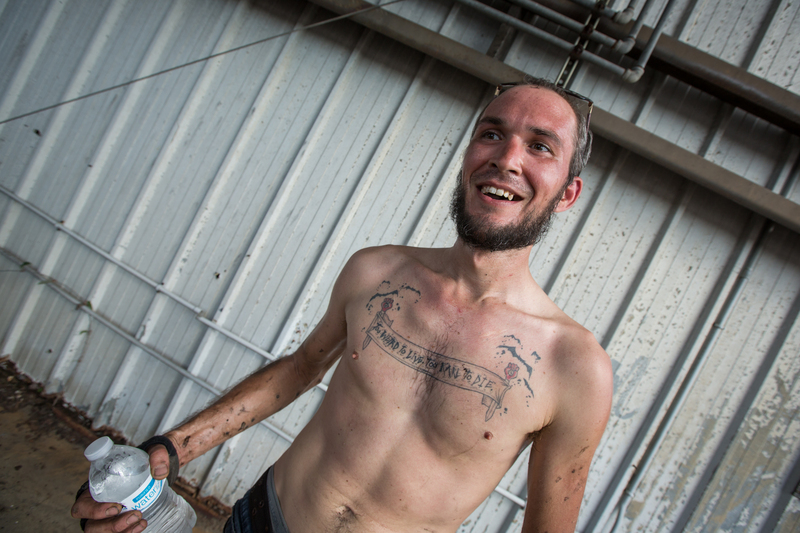 Everyone is coated in sweat, mud and smiles. ‘Cross is here. Great article, Bruce! Glad you came out to document the event! 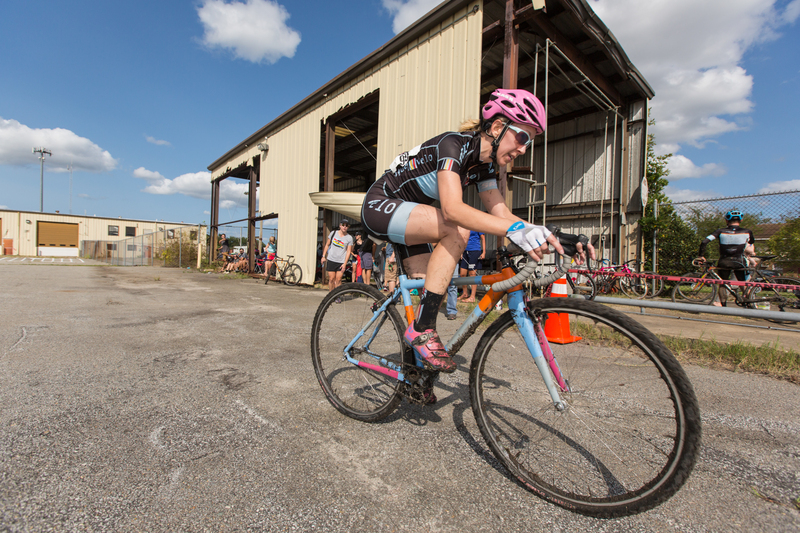 Rust Bucket was my introduction to racing ‘cross, and the opening day races solidified my resolve to do more races, and to continue doing them fixed gear! Cheers!